8mm Forum: Eumig S936 - questions from a newbie. » 8mm Forum » 8mm Forum » Eumig S936 - questions from a newbie. Author Topic: Eumig S936 - questions from a newbie. Hi all... this is my first post but I've been a lurker for a little while. I recently upgraded my Agfa Sonector LS to a Eumig S936. I've had my eye on an S938 for a while but while I've been waiting for one to come up I couldn't resist an absolutely mint S936 that came my way. It looks like it's hardly been used. I'm delighted with the improvements it's brought, but wondered if there was anything I need to know to keep it in tip-top condition. I don't have any stereo films yet, but as I understand it the 936 will play both tracks and output them as a mono signal. I think I remember once reading about a tip to preserve the balance stripe sound head to keep it from wear when playing mono films - does that fix apply to this projector too? I know that it only has a 100W bulb, but I would be interested in trying out a scope lens, and see that Van Eck even have a scope lens holder to fit my machine. How successful is a scope lens with a machine like this, and what lens would you recommend? Is it worth upgrading the main lens on the machine? I can't say how pleased I am with the machine itself. It feels like a really beautiful piece of engineering and is very kind to the films. Congratulations John, you have purchased a lovely machine there as indeed are the Agfa Sonnectors. I have only one Super 8mm Projector that is genuinely bright enough to project scope films with an anamorphic lens. Even most of the brightest 150w lamp machines (and the 938 sadly, isn't one of them), struggle with adequate brightness levels when beaming through all those planes of glass. Especially if you are wanting a image size around 6 or 8ft wide. You really need an equivalent brightness to the GS 1200 with a very fast lens and preferably a two bladed shutter to get the perfect image of scope films even for moderate screen sizes. Andrew, was there a slip of your typing above? Did you mean 936? Hello Maurice, no sorry Maurice, I was referring to the standard lens 938 as John was ultimately seeking a 938 to watch his films with and took a 936 as a compromise. The 936 will be only capable of relatively small scope images due to its modest 100w lamp I feel. You would suspect that the 938 would be much better with scope images given its more powerful 150w lamp, but it actually doesn't really. The reason for this is with its single lamp setting, 3 bladed shutter and very average f1.3 lens that includes the extra optics in the optical levelling system, it simply isn't bright enough from standard to provide a suitably bright image over 4ft wide. This is the reason why I recommended a projector of similar brightness levels to a standard GS 1200 to John before he need worry about purchasing a scope lens, bracket and films for his machine. Apologies for the confusion Maurice. I remember the 936 very well John as I ordered a new one when they first became available about 79 I think. You will be pleased to know I still have the 936 and it has been a great projector all these years, being light, portable and reliable also having the original sound heads in. By the way John I have used my 936 with a Kowa scope lens over the years many times on a 9ft screen. Be sure to use Osram lamps in it for the best brightest effect. Wow Lee, you must live in a Bat Cave! Uncle Lee's top tips for Eumig scope film presentation. 3: Osram lamps for your Eumigs, change lamp every 30 hours or so. 6: Spend your money on a very good anamorphic lens Kowa 8Z is my personal choice. If all else fails move to proposed bat cave. I do all of the above Lee,with the exception of only choosing bright colourful films to watch in scope. Yet still not even my beloved Bauer T610 is bright enough for me using the Kowa 8z on anything over a 5ft wide image and with the f1.1 Schneider lens it is far and beyond brighter than my S938. I guess it depends on what you're satisfied with, but to me only a two bladed Beaulieu or GS1200 / 9119 would cut it for anything over 6ft wide. Too much detail is lost in my humble opinion using anything else. I have to admit, I like the vibrancy of the rich colours to bounce off the screen when projecting the lovely low fade prints.It's all part of the overall enjoyment of projecting a film to me. That is the problem Andrew once you have a two bladed machine with a Schneider lens in it or a Xenon nothing much else will do. The nostalgia thing drives my interest more than anything these days me thinks. You're right of course Lee. Hopefully I will find a decent example of my dream machine one day! Alan Rik already has one... lucky bugger!! I use a Eumig 824 Sonomatic with the handy little Hypergonar Cinemascope lens (which did not cost the Earth) using a plastic sleeve to fit over the f1.2 lens. I use the Xenophot 100w A1/231 lamp (20% brighter!) and obtain a very pleasing 7foot by 3foot picture. The films I use are clear prints and include Born Free, Ben Hur, Dr Who Invasion of the Daleks, Airport 1975, North West Frontier, Tom and Jerry and various trailers. No problems with focus, very pleased with the results. Thanks for getting back to me everyone. I watched my first full feature on Saturday night - RAISE THE TITANIC (flat) - and was delighted with the picture and sound. Surprisingly, Raise the Titanic wasn't half as bad as I was expecting it to be. I can only imagine that the Derann cut down rattles along at a rare old pace. So with regard to the scope lens, there are two schools of thought... I might see if I can borrow / rent a lens to give me an idea if it's something I want to pursue. 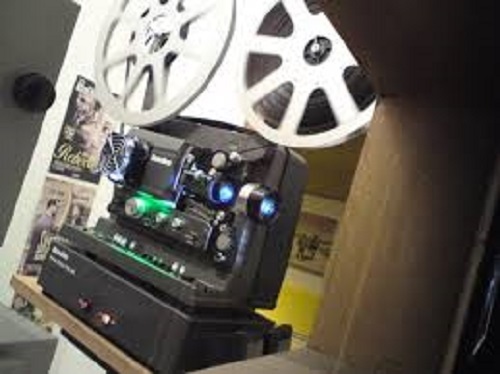 Andrew, I have been reading an old Derann "Film for the Collector" and was surprised to see the Beaulieu 708EL HTI advertised at £3.995.20 at the Widescreen Centre, exactly £2,000 more than the standard halogen lamp one. Yeah, I have that same copy of F.T.T.C. also Brian, makes you drool doesn't it! The later issues of F.F.T.C. well into the mid to late 90's, advertise the standard model from the Widescreen Centre at around £2400 and by then it didn't even come with a Schneider lens! John you may very well be satisfied with your projector using a scope lens with it. It all depends as said, on how bright you would like your picture to look and how wide you like to project it. Like you say,I think it wise if you borrow one first this will give you the opportunity to see the results for yourself in advance of spending a serious amount of money on one of the better scope lenses like the Kowa 8z for example.